You’re listening to NPR…on your iPad. That’s right, National Public Radio has an iPad application ready and waiting for your listening (and reading) pleasure and it’s in the App Store now. 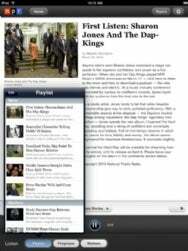 NPR for iPad uses a magazine-style layout to focus on the news, music, and lifestyle content that NPR prides itself on. Plus you can listen to over 1,000 live streams and playlists, right from your iPad. The coolest aspect of the app (I haven’t used it myself yet, but it sounds cool) is the audio player. You pick whatever stream you want to listen to, and it plays in a player at the bottom of the app. You can freely navigation around the application, read stories, and what have you, all the while listening to your stream. Of course, you have to have to be in the NPR App for iPad to hear the stream—no background playing here. But what if you don’t want to download the free iPad app? NPR has something for you: an iPad-optimized version of their Website that features an iPad-friendly audio player (which also has the neat “keep playing while I check out other sections” feature). The URL for the iPad-optimized version of NPR.org is iPad.npr.org (though NPR notes if you want to see this on your desktop you’ll have to use Chrome). The NPR App for iPad is free and available in the App Store now. It requires an iPad running iPhone OS 3.2 or later.